A tough, O-Ring sealed, medical utility box that can be used in 101 different ways. 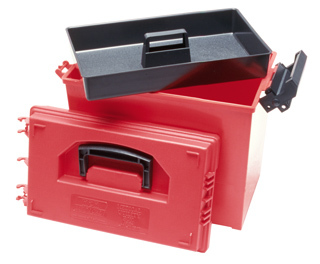 Designed as a water resistant container, this box features a reliable "tongue & groove" construction to help keep out everyday dust and moisture. The handy 2" deep lift out tray provides easy access to small items while leaving plenty of space below for large items. A comfortable recessed handle rests on top of a military style removable lid. The large, easy to open, latch may be pad locked for security. Box measures 15.5 x 8.5 x 12 inches and is stackable.